Charles W. Moore is often acknowledged to have been one of the twentieth century's finest designers of domestic architecture. A little-known but important aspect of Moore's career is his work in housing for low and moderate income residents. Social Responsibility in an Era of Postmodernism studies this aspect of Moore's work. 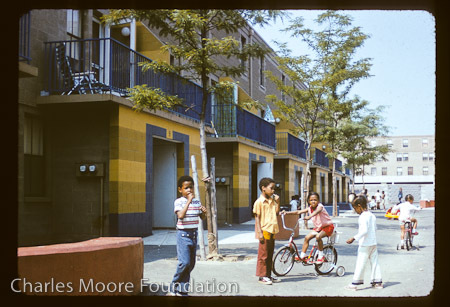 Moore completed seven affordable housing projects and designed several housing schemes that were never built. This project documents each of these seven built works, all but one of which are in the northeast region of the country. The study also considers Moore's unbuilt schemes, including his 1969 proposal for housing in eastern Kentucky, which received an award from Progressive Architecture. These projects are placed in the context of Moore's architectural career, to relate them to his philosophical interest in inhabiting, and to understand the extent of Moore's commitment to social responsibility. Richard W. Hayes is an architect and architectural historian. He earned his master's of architecture degree from Yale University's School of Architecture. His research focuses on the Aesthetic Movement in nineteenth-century England and American architectural culture of the 1960s. His prior publications include The Yale Building Project: The First 40 Years, a comprehensive history of an important program in American architectural education that originated in the context of student activism and volunteerism during the 1960s. In 2009, Hayes was a visiting fellow at the University of Cambridge. And in 2013, he retured to Cambridge as a visiting fellow of Clare Hall.